Black N Bianco Boys' Signature Sateen Dress Shirt in Blue. Made and designed for kids. Comfort. Style. Modern. Please Iron me on the lowest settings. 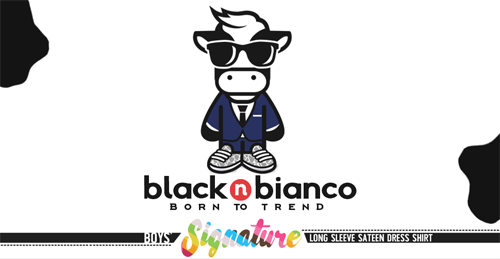 Our boys signature sateen long sleeve dress shirts were specially designed and made for kids. Our sateen cotton fabric has a lustrous surface creating a very soft, smooth and luxurious touch when worn against the skin. The buttons feature silver trims on side adding an extra layer of style and personality. A classic dress shirt with a modern flair. Got 2 of the royal blue shirts for my grandsons as ring bearers in my daughter's wedding. Sizes 3 & 6, good fit, sizes true & beautiful color. Love this shirt. Got it for my 3 year old to show her pony in, she's 44# and just turned 4. I got the size 5 and it's slightly large but looks good and gives her a little time to wear it. It is soft and flexible and the blue color is amazing! Copyright © 2019 Black N Bianco. All Rights Reserved.